Six groups of Exiles, totaling 209 persons and 52 families, arrived in Philadelphia, 1731 to 1737, but the largest — the third — contained 44 families and 170 persons. The day after they arrived, the able-bodied men affirmed allegiance to the British King, George II, and the following day, perhaps in the nearby Friends meeting house, all of the group held a thanksgiving service for their safe arrival in a land of religious tolerance. Every year thereafter on the anniversary, a similar service has been held in one of the Schwenkfelder Churches. Currently it is celebrated on the Sunday closest to September 24. A religious/historical address is presented and a meal of bread, butter, and apple butter is enjoyed, commemorating their first Day of Remembrance (Gedächtnis-tag). It is said that this is the only group of religious exiles who, from the first, have perpetuated their arrival here with an annual celebration of thanksgiving. Honorable Samuel W. Pennypacker, Governor of Pennsylvania, mentioned this fact in his address delivered on September 24, 1908, at the 175th Schwenkfelder Day of Remembrance. There was a high degree of literacy among these immigrants and some brilliant scholars. One Schwenkfelder, Rev. Balthasar Hoffmann, conducted a correspondence course in Hebrew before the Declaration of Independence was signed. The early settlers built homes for themselves in Salford, Towamencin, and Worcester Township areas of Pennsylvania, as well as in the Upper District of Hereford and Upper Hanover townships of the Perkiomen Valley, where many descendants now reside. “Members from the Schwenkfelder churches in Palm, Upper Hanover Township; Central Schwenkfelder in Worcester Township; Olivet in East Norriton; and the Philadelphia Mission church plus staff members from the Schwenkfelder Library & Heritage Center, Pennsburg traveled to Harrisburg on Wednesday, September 24, to witness the adoption of a special resolution honoring the Schwenkfelder Day of Remembrance. 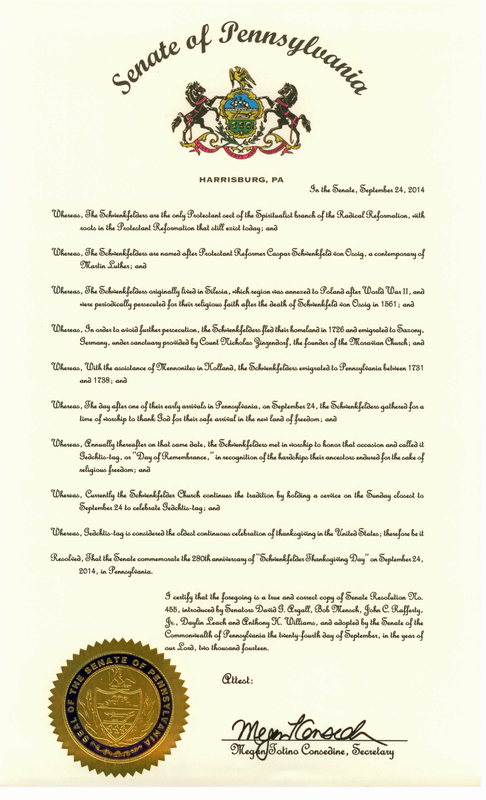 “A Schwenkfelder Thanksgiving Day of Remembrance Resolution was adopted by unanimous consent in the Pennsylvania Senate. Introduced by Senator David Argall (29th), a Schwenkfelder descendant, the legislation was co-sponsored by senators Bob Mensch (24th), John Rafferty (44th), Daylin Leach (17th), and Anthony Williams (8th). This was special recognition of the fact that our country’s longest continuous thanksgiving celebration began 280 years ago: on September 24, 1734, Schwenkfelder immigrants fleeing persecution in Europe landed here to pursue religious freedom, build new homes and, in the process, help create America. “The session was opened with a prayer from guest Chaplain Rev. Dr. David McKinley, Senior Pastor of Central Schwenkfelder Church and Conference Minister of The Schwenkfelder Church. The Schwenkfelder delegation joined the senators for lunch following the session. An oil painting by Adolf Pannash, depicting the landing of the Schwenkfelders from the St. Andrew at Philadelphia, September 22, 1734, was one of the features of the Schwenkfelder Bicentennial commemorating the arrival of the Schwenkfelders in America in 1734. The desire for such a picture had frequently been expressed by members and friends of the Schwenkfelder Church. In 1932, former minister of the Palm Schwenkfelder Church, Rev. Lester K. Kriebel, had the fortune and pleasure to make the acquaintance of Mr. Adolf Pannash, a commercial portrait painter of Flushing, Long Island, NY. Mr. Pannash, a cultured gentleman and well-read in Reformation history, became acquainted with the Schwenkfelder history, and finally consented to paint “The Landing of the Schwenckfelders from the St. Andrew, Philadelphia, Pennsylvania, September 1734.” By the end of June 1933, he submitted a trial pencil sketch tinted with water colors. This sketch met the approval of a group of interested members of the Palm Schwenkfelder Church who pledged themselves to sponsor the painting. At the end of July 1933, the trial sketch was returned to the artist by Rev. Lester K. Kriebel, who instructed him to proceed at once with the painting of the picture. The painting was completed May 1, 1934. The painting was removed from Flushing, Long Island, to Philadelphia, PA, May 10, 11, 1934, and deposited with the Franklin Printing Company for the purpose of making colored reproductions to be put on sale after the unveiling of the painting by the artist during the special Bicentennial Services at the Palm Schwenkfelder Church, Sunday morning, September 23, 1934. The size of the painting, oil on canvas, is 32 x 50 inches, and bears the signature, Adolf Pannash, 1934, in the left foreground. The theme is the landing of the Schwenkfelder immigrants from the St. Andrew at Philadelphia, PA, on September 22, 1734, presumably at the dock located at the foot of Walnut Street. The large sailing vessel in the center on the Pennsylvania shore represents the St. Andrew from which the passengers are disembarking. In the background of the picture, the artist has shown the flat shores of New Jersey on the east side of the Delaware River. The large brick building in the background on the right is a representation of the town hall as published in “The SesquiCentennial High Street (1926).” The smaller stone building to the left is a reproduction of the Indian Queen Inn located near the wharf during the first half of the 18th century, and the low cottage on the left of the Inn, close by the river bank, is an exact reproduction of Pastorius’ house in Germantown, PA. The British soldiers and citizens in the background, as well as the canoe in the inlet with four American Indians, are an indication of the approximate time in American History when the landing took place. In the right foreground, the artist has represented four Friends (from right to left), representing a spiritual leader, a schoolmaster, a councilman, and a private citizen, extending an official welcome to the Schwenkfelder immigrants through their chosen leader and religious instructor, George Weiss. Immediately behind Weiss, the artist has skillfully grouped the 171 exiles in their quaint Silesian homespun dres, with their scant but precious belongings, chief of which were their religious books that were valued so dearly. The two chests in the left foreground and the several books are exact reproduction of the originals preserved in the Schwenkfelder Historical Library [now the Schwenkfelder Library & Heritage Center] at Pennsburg, PA. Seated on a chest at the extreme left is the youth, Christopher Schulz, 16 years of age, completing his diary of that eventful trip, which has been preserved in print. To the right of the youth, the artist has placed a basket of apples on another chest behind which stands George Schultz in somber dress, who had come to Philadelphia in 1731. 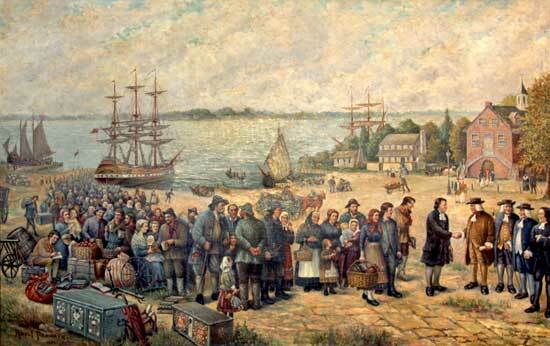 The records state that George Schultz met the Schwenkfelders at the wharf and presented them apples and beer and is thus depicted in the painting. At least twelve children appear in the picture. The records reveal the fact that the average age of these Schwenkfelder immigrants was 35 years. A study of the faces not only shows the relative youth of this group, but also, strong individual characters. In spite of the usual confusion attending the unloading of a ship and the minute details preserved in the picture, the artist has portrayed a marvelous spirit of reverence and dignity in this landing scene. The first casual glances at the picture capture one’s attention and demand a more profound study of an interesting event along this historic waterfront. A spirit of peace, inward joy, and victory is manifest in the faces of these immigrants after months of anxiety, hardship, and suffering in Europe and after the perilous voyage across the Atlantic. The beautiful, delicate light cast across the waters of the Delaware River, illuminating the St. Andrew, may be symbolic of the new ray of hope and joy in the hearts of the Schwenkfelders as they stand on the shores of a new country which has promised them liberty of conscience so ruthlessly denied them in their ancestral Silesian home from which they came. It would have been difficult to secure an artist better fitted than Mr. Adolf Pannash to paint a picture of the landing of the Schwenkfelders. He was born in Spremberg, Brandenburg, Germany, March 13, 1865, a short distance north of the province of Silesia and, consequently, was familiar with its customs and people. In 1882 he came to America in his eighteenth year. NOTE: The spelling of the name “Schwenckfelder” with a “c” before the “k” in the title of the painting is an archaic spelling of Schwenkfelder no longer in use today in America, but still occasionally used in European writings. Because it is the artist’s title for the painting, the spelling Pannash used remains in the title. 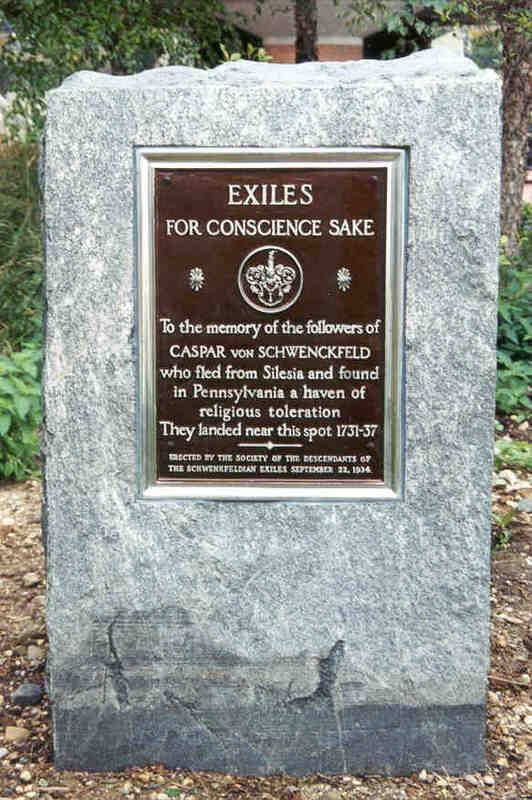 In 1934, on the 200th anniversary of the landing of the Schwenkfeldian Exiles at the foot of Walnut Street, Philadelphia, PA, a bronze tablet was placed on the Webb Building at Delaware Avenue and Walnut Street, Philadelphia, PA, and dedicated. With the development of Penn’s Landing, the plaque was moved to a pillar at the foot of Walnut Street Mall and rededicated on September 19, 1976, at the 242nd Gedächtnis-tag (Day of Remembrance). Sometime in 1977 this bronze plaque disappeared and an aluminum plaque bearing the same inscription was installed to replace it. Due to more renovations to the Penn’s Landing area, the aluminum plaque was again temporarily removed. In early January 1999, the FBI returned the original bronze Exile plaque, which had been missing for 22 years, to the Schwenkfelder Library, Pennsburg, PA. How exciting that this long-lost tribute to our ancestors re-surfaced after all that time. David Luz, Executive Director, Schwenkfelder Library, was quoted, “ It’s a reminder of the sacrifices of our forefathers . . . a reminder of what they went through for coming here so we can be here today.” (For full article, see the Philadelphia Inquirer, Neighbors North section, Monday, January 18, 1999, pg. B1. )When the new Schwenkfelder Library & Heritage Center was completed in 2001, the original bronze plaque was installed in the Heritage Center with a proper legend explaining its history. The aluminum replica was mounted on a granite monument and installed in the third garden outside of the Independence Seaport Museum (north side). A rededication service was held there on Sunday, October 13, 2002. The Society of the Descendants of the Schwenkfeldian Exiles very much appreciates the generosity and willingness of Penn’s Landing Corporation to permit us to relocate our Schwenkfelder Exile Plaque Monument in their Waterfront area. They helped us to make this project a reality and we are delighted to now have our plaque on display in a beautiful, easily accessible, and historic area. From Schuylkill Expressway: Use Vine Street Expressway (I-676), proceed onto I-95 South, then follow directions below From I-95 traveling south. From I-95 traveling south: Take Exit 20 (Columbus Blvd/Washington Ave – look for Penn’s Landing signs); CAREFUL – left hand exit. Turn left at foot of ramp onto Columbus Blvd. Proceed to parking lot near Independence Seaport Museum. From I-95 traveling north: Take Exit 20 (Columbus Blvd/Washington Ave – look for Penn’s Landing signs). Turn left at foot of ramp onto Columbus Blvd. Proceed to parking lot near Independence Seaport Museum. On September 24, 1884, at the 150th Gedaechtnis-tag, the speaker, Dr. Chester Hartranft, challenged the Schwenkfelder congregation to collect and publish a definitive edition of Schwenckfeld’s writings. Seventy-seven years later, in 1961, the last of 19 large volumes making up the Corpus Schwenkfeldianorum appeared. The editorial and historical materials collected during this endeavor are preserved in the Schwenkfelder Library and Heritage Center. The Corpus consists of 1252 documents, 17,886 pages (covering 408 different theological topics) written by Schwenckfeld during the 40 years, 1521-1561. The Corpus is now available on DVD from the Schwenkfelder Library & Heritage Center. On the bicentennial anniversary of the moving of the group from Silesia to Saxony, the Society in 1926 presented an elaborate pageant of the early days, with script by Dr. Samuel K. Brecht. The pictures taken were published by the Society as an issue of The Exile Herald, a modest publication that was issued for members. Another pageant was presented in 1934 during the bicentennial celebration and again in 1976, the 250th anniversary. The completion of the Corpus Schwenkfeldianorum in 1961 resulted in a new understanding of Reformation history and of Schwenckfeld’s role therein. In 1984, on the 250th anniversary of the Exiles’ safe arrival in the New World, a colloquium was sponsored by the Schwenkfelder Library. A number of revisionist books and papers had appeared in 1961 and several of the authors spoke at the colloquium. In addition to the scholarly lectures, topics of popular interest relative to life in Pennsylvania were presented. Wonderful record and painting. Are there any lists of passengers available? I maiden last name was Cress and think I may have ancestors among them. Also Hacker, Hocker or Tyson, Dyer. Scanned images of the passenger lists for the six migrations made by the original Schwenkfelder immigrants are shown under the tab IMMIGRANTS/SHIP LISTS, then go to the FIRST MIGRATION through to SIXTH MIGRATION on the drop-down menu to see the list of immigrants. Note that not all passengers on the ship’s passenger lists are Schwenkfelder immigrants — only the ones listed in tables below the images. I am trying to locate any references to my JACOB TSCHUPP ancestor, having family documentation to include a birth date of 1757 of unknown location, died in 1833 in Stark, Ohio. Our Jacob Tschupp – cannot locate his grave. We have a reference to a will that was naming a Spitler. Family trail has Brethren – with trail from Elkhart, Indiana, from Stark, Ohio and possibly Pennsylvania (presumably Blair County/Northumberland). We also are trying our best to pin down his children names. We also have a wife Hannah Miller-Nee from Virginia who Married a Daniel Paulus/preachers son before marrying Jacob Tschupp. I’m sorry, but the surname Tschupp does not appear in any of our Schwenkfelder records (immigrant lists, “Genealogical Record of the Schwenkfelder Families”, or our GR Update File Project).